After you find your treats and prizes, you can refill and use for your next party (if your guests don't take them home that is)! Adorned with sparkly gems and mini mirrors. 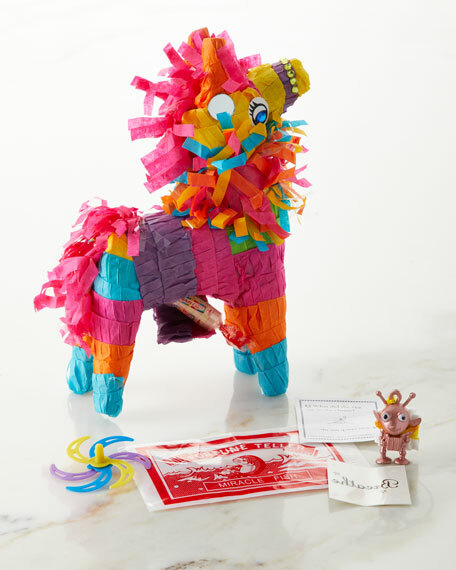 Refillable table top pinata for decorating or gifting. Contains six prizes (which vary by style) include: vintage-inspired toy, riddle, Fortune Fish, Tattoo, Charm, and Smarties Candy. Paper; embellished with rhinestones and acrylic gems. For adults and kids over 3 (due to small parts). 2"W x 5.5"D x 7.5"T.
Boxed weight, approximately 1 lbs.